The Joe's Ridge trail is located in the North Fruita Desert Area, at the north end of 18 Road, about 8 miles northwest of Grand Junction, Colorado. 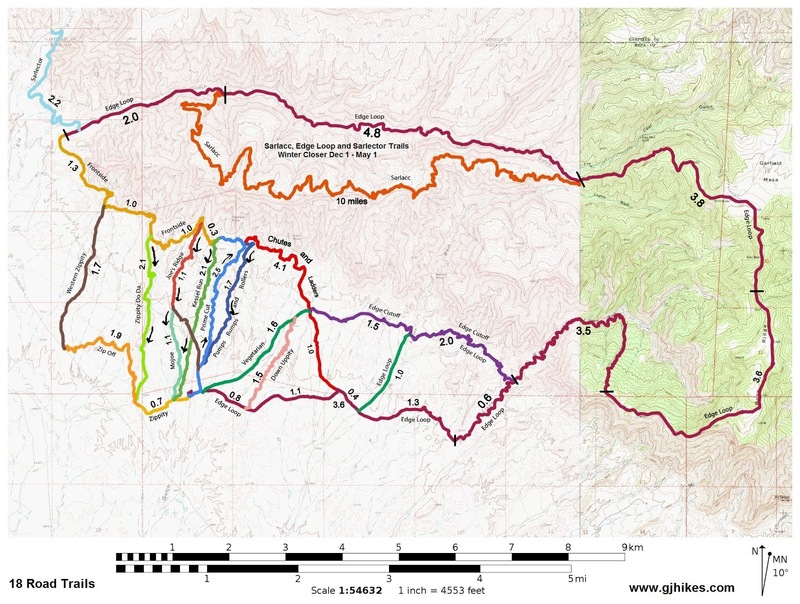 The 1.1 mile long trail is a downhill only route that begins off of the Frontside trail and ends at V.7 Road. 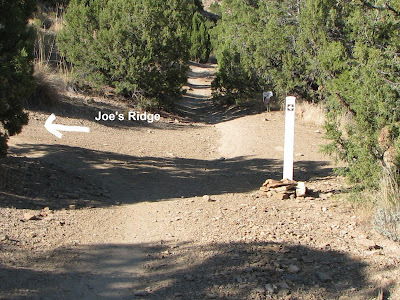 Joe's Ridge has a few steep sections of downhill that require a little caution upon approach. Riders are well advised to keep their speed under control. Unlike Zippity Do Da where advanced riding skills are recommended, Joe's Ridge is normally classified as intermediate. 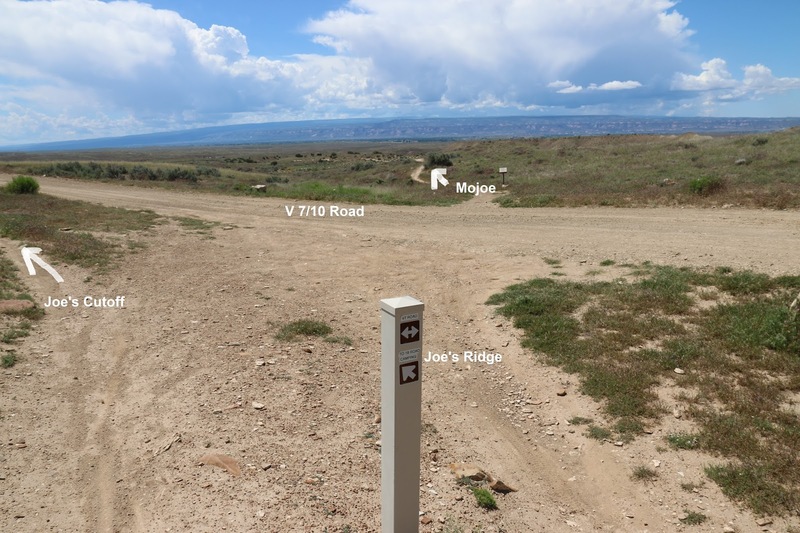 When beginning at the North Fruita Desert trailhead a common route is to come up Prime Cut and then take the Frontside trail to the top of Joe's Ridge. The total distance from the trailhead is about 2.8 miles to this point. The first 50 feet of the trail makes a sharp climb away from the Frontside trail. A long stretch of the trail comes into view immediately after the initial climb. 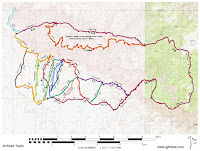 The upper part of Joe's Ridge is an easy roll that nicely follows the contours of the mountain. A good vantage point comes up for looking out over the 18 Road area and the rest of the valley. From there a long section of steep downhill grade follows the apex of the narrow ridge.. The trail continues snaking its way down a hogback losing elevation like a plane on its final descent. The ground spreads out at the bottom of the hogback and the trail continues its descent. When you stop for pictures everyone else blows right on by. The last stretch of the trail flattens out quite a bit but still trends downhill. It all comes to a quick end at V.7 Road. From here you can follow Joe's Cutoff to the left and get to the campground, Kessel Run and Prime Cut. The newer Mojoe trail continues directly across the road. Mojoe is the same 1.1 mile length as Joe's Ridge. Rather than a steep downhill run it has lots of fun bumps and jumps. If you would like to see it for yourself then all you have to do is grab your bike or 'Take a hike'.